We're loud, proud and on the prowl with our own Jacksonville Jaguars! 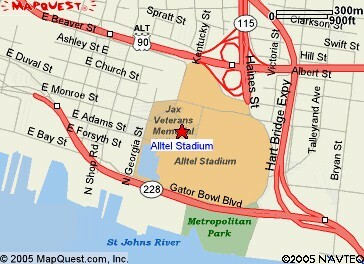 to get the official 2008 Jacksonville Jaguars schedule! Love to tailgate before watching the Big Cats play? Give us a call and order your favorite barbecue to pick up on your way to the stadium! While visiting the stadium, you can satisfy your taste buds with Cole Pepper's Blackjack BBQ Sauce found at the concession stands. We smoke the competition when it comes to taste. So, pick some up and pour it on. Cole Pepper's Blackjack BBQ Sauce, created by our proprietor, Rich Goldfarb and Cole Pepper of WOKV, will be proudly displayed, and for sale, at many area locations including Blackjack's Best BBQ, Firehouse Subs, In the Kitchen and Riverside Liquors.